Okay, I have a layout that in my mind should work. Can you please review it so that I can be sure the investment will not end up a pile of track in a box? Two separate tracks. Each track will have its own power transformer and control. All Atlas true-track components. 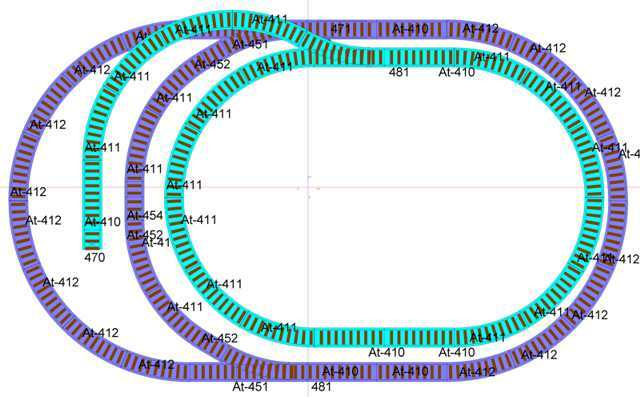 The purple track is for an Atlas locomotive with four cars (Atlas HO 35). The main radius is 22" the inner loop is an 18" radius. Are the radiuses okay for this train at moderate to slow speed? The blue track is elevated to clear the bottom track and will run a single (inexpensive) Bachmann trolley car. It includes a switched side that ends in a bumper. I assume that if the trolley is not stopped using the transformer control, it will jump the bumper correct? Thus I plan on installing an auto reverser (Circuitron 5401 AR-2 Automatic Reversing Circuit). After the rev circuit reverses the trolley, I assume that the trolley will continue to run in reverse until the operator changes direction at the transformer control correct? Any issues I should consider in regards to the auto reverser? When the trolley transverses the loop in reverse I assume it will jump the track if the side switch is not returned to the original state, correct? Any way to prevent such derailments? I plan to use an Atlas 205 connector block that includes three SPST electrical switches to control the track switches. Should that work? I may substitute mini toggle switches. I am concerned about the track switches and derailments. Again, I assume the train / trolley will derail if it hits the track switch with the switch set to the other direction, correct? Is there anything I can do to prevent such derailments in case the kids forget to switch the track correctly? Thanks again for all of your help!!! Jack, you should be OK with the 22" radius, by Atlas HO 35, is that the engine type? Or a GP-35 or SD-35?? You are correct to assume that once that trolley comes out, makes the loop, it will derail when it hits the closed switch. Someone is going to need to throw that switch. Is the siding for the trolley a station or something?? You could eliminate the siding, make it a loop, put a delay on it and it'll stop at the station every time before continuing on. Might be a bit easier. The trolley side and switch was to add some interest and there will be a station at the bumper-end. I am checking with a local circuit maker to prevent the derailments. AFAIK AR-2 has input for a sensor so it can stop the tram before it hits the bumper. switch can be modified to have free moving points , tram going to open them as it goes . but i never seen atlas true track so not sure about that. You might want to my Beginner's Guide to Layout Design (click below). It will take you about 10 minutes. Thanks for the advice. Will take a lot more than 10 minutes to digest your site, but the Beginners Guide is very helpful. I am now in a quandry whether to rethink it all....yikes!!! Better to rethink than to rebuild.